Almost the beginning of the new school year ! 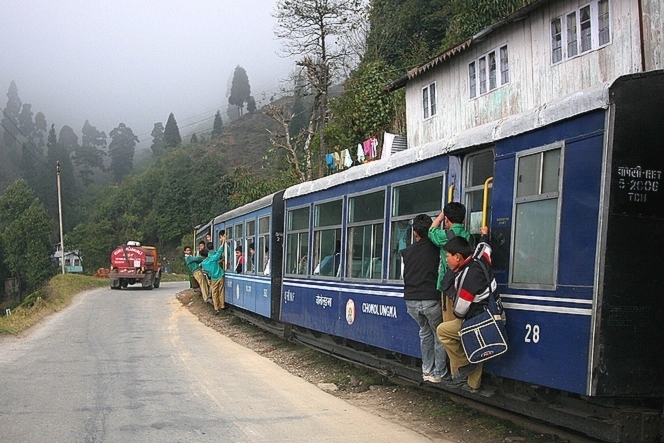 In Kurseong (India), these schoolboys jump on the Toy Train’s bandwagon and hold on the outside, not because the train is packed, but simply because it’s actually more fun doing the journey with the head in the breeze. They laugh, say hello to the people they know when the train crosses a village: a pleasant way to get to school. When I left Darjeeling in October, it didn’t seem to sadden these school children in the slightest, and they had fun clowning around while I took a photo of them….